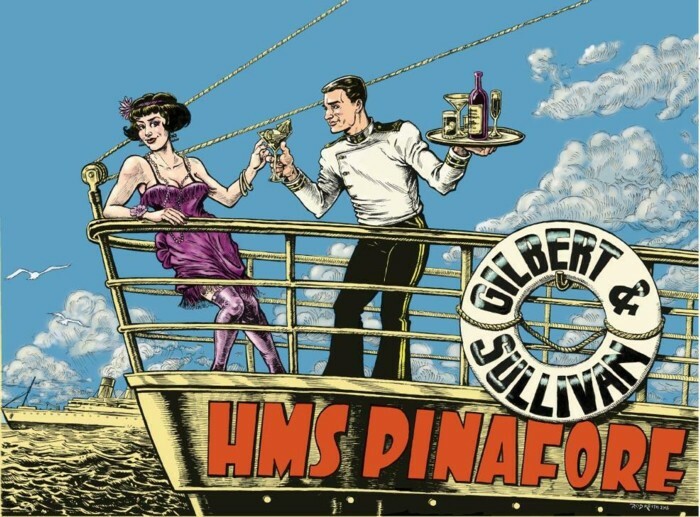 The fourth collaboration between Gilbert & Sullivan, H.M.S. Pinafore was their first blockbuster hit, opening May 28, 1878 at the Opera Comique in London, England. It ran for 471 performances and became a huge fad in England, as well as in America, being copied illegally by dozens of performing companies in the U.S., as well as being presented there by Gilbert, Sullivan and D'Oyly Carte themselves. Pinafore is among the most popular Gilbert & Sullivan operas, perhaps because of its infectious tunes and generally well-constructed libretto. The gentlemanly Captain of the Pinafore, who claims that he would never swear at his crew, does not know that his daughter has fallen in love with a common sailor serving on her father's ship. Meanwhile, the Captain has arranged for her to marry the First Lord of the Admiralty, Sir Joseph Porter, KCB. Sir Joseph, himself, has risen from humble beginnings to gain his office by political acumen, despite having never gone to sea. And the Captain, himself, fancies a poor bumboat woman...little Buttercup. Fear not: it all works out in the end. Hip, hip, horrah! The Male Chorus - Robert Bailey, Bill Hanlon, David Jeffrey, Brian Lester, Christopher F. Parker, Phil Pentecost, Ken Sperling, Matt Stewart, Emil Wijnker. The Female Chorus - Emily Banavage, Casandra Campbell, Karen Carroll, Elisabeth Geertsma, Charlotte Knight, Laura Meren, Shelley Oakes, Gretchen Rozek, Rebecca Surman, Ceris Thomas, Amanda Vallejos, Shannon Watson.